“Dalai Lama spreads happiness..If you think positively when you resist there’s a greater chance that you will succeed,” says Bob Thurman who calls himself “a realistic optimist in the current nightmare caused by leaders that are ignorant, greedy and stubborn”. Since the early sixties he’s been a close friend of the Dalai Lama. Last year he published the book ‘Man of Peace’ which introduces the Tibetan buddhism to the younger generations. 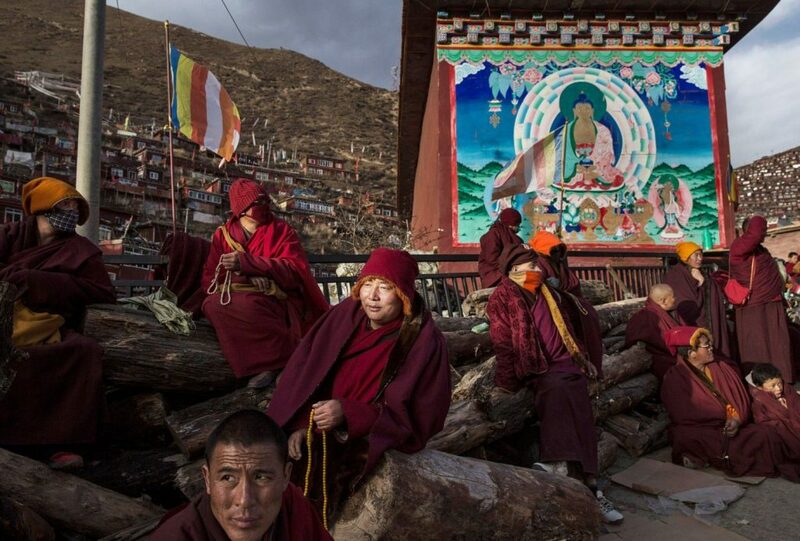 Despite Tibet’s many challenges, professor Robert Thurman takes the brighter view. China will gain from a good relation with the Dalai Lama. When that happens, Tibet will become the jewell of the Chinese empire. IT’S BEEN almost 70 years since the Chinese military crossed the Tibetan borders which hastened the young Dalai Lama’s accession of the throne. 70 years on the fate of the Tibetan people is still unsure. “The Tibetans are the baby seals of the human rights movement, because they’re non violent and believe in word peace. But they’re still being crushed. The Dalai Lama told the Chinese a long time ago that even even though they were invaded in the 1950s they do not need independence if they’re allowed their own constitution and if they allow them to have a minority autonomy, they’d be happy to be a part of a Chinese union. But the Chinese are pretending the Tibetans want to separate to have an excuse to be hard liners,” tells Robert Thurman, founder of Tibet House in New York. As a professor of religion at the Columbia University he has specialized in the Indian and Tibetan versions of buddhism. That religion and international politics are cut from the same cloth was a lesson that Thurman learned as a young Harvard freshman when he first met the Dalai Lama in his Indian exile. The iconic leader who is perceived to be the 14th reincarnation of his predecessor was only 19 when he negotiated his country’s future with China’s Mao Tse-tung. After several years of failed peace negotiations he fled to Dharmsala where he now functions as the Tibetans spiritual leader while he has handed over his political obligations to the Harvard educated professor, Lobsay Sangay. Why is Tibet so important today? Tibet is very important because it is a colonial possession of China. And China is a big emerging power in the world trying to convince people that they’re not a threat and so good and great to do business with. They’re cracking down on Tibet along with the Uyghur people of Xian. How can they be believed when they are cracking down on their own people though Hong Kong, Vietnam, Philippines, South Chorea has relaxed their control of minorities? When China controls something they crush them; their culture, their freedom. If they say they have everything under control they’re completely crooked. The Tibetans are second class citizens so Tibet is a symbol, though buddhism is different in Burma and Sri Lanka. Buddha is not threatening, it is not jihad. And yet they’re ruthlessly crushing them. So I think its an old fashioned policy of China. They’d like to change but haven’t decided how and they don’t want to make a mistake. In Scandinavia governments have learned that the Chinese are so insidiously trying to control the world media in the same way they control their own media, and have the own version of the press, and the history and future. They’ve realized that the Chinese won’t accept there’s free speech in so called democratic countries, and that they can’t suppress the people, so the do suppress them. Tibetan Buddhist monks rest during a chanting session. Photo Kevin Frayer for the Washington Post. Will that change? I think I’m one of the rare people who think things will get better soon. Because China wants to function on the world stage, they will get public relations advice and probably think they’ll get a dictator’s advice on how to lie. But instead they’ll learn that the best way to show that you’re nice is to be nice. Especially when you can, and they certainly can with Tibet. There’s a very foolish fraction now in the politbureau who are crushing the muslim people of Xiang. They have to retract the angry, jihadist type by creating such a a harsh suppression. Tibet is way down the list, and has been since the 2008 Olympics. They cracked down on them very harshly, but it paled in comparison to other countries. The Uyghurs are in a terrible state. A million people in detention are being educated to be good people and communist Chinese citizens, instead of being muslim. It never works, they’re very resilient. I think the president Xi does recognize this, but you can’t change suddenly, they don’t want to make a mistake and continue the Chinese way for colonial centuries, not realising that they can make public relations out of a good relation with the Dalai Lama. Tibet would be a test page of how you can support people who are non-Chinese, and not crack down and chew them up as citizens in a nation machine. This would put people at ease in places such as Hong Kong and Taiwan tremendously. I think he realises that, President Xi – I call him Emperor Xi at this point, almost. People don’t realise that even emperors don’t have absolute power and that it takes time to change policies. When could it happen? I’m very optimistic that this will happen soon and within the lifetime of the Dalai Lama. He’ll be 84 next year and there will be many headlines, I think, when they make the conditions appropriate so that he could visit his people in his homeland. They have to persuade him that he can go to see his people, that he won’t go to prison. He can only go there when China says publicly that they will change their attitude about him and about the people and about buddhism. President Xi said they need ancient culture, that there’s a need to rehabilitate Confucius, and his family is interested in buddhism. 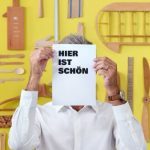 I have no doubt there will be change, but when? That’s always the question. The Tibetans survived the cultural revolution, and prior to that the Great War of the fiveties when they quarantined hundreds of thousands when they turned everything upside down with their class struggle reforms and the gulag. They survived all that and they’re still Tibetans and they’ll survive anything else, so I’m optimistic about the future. 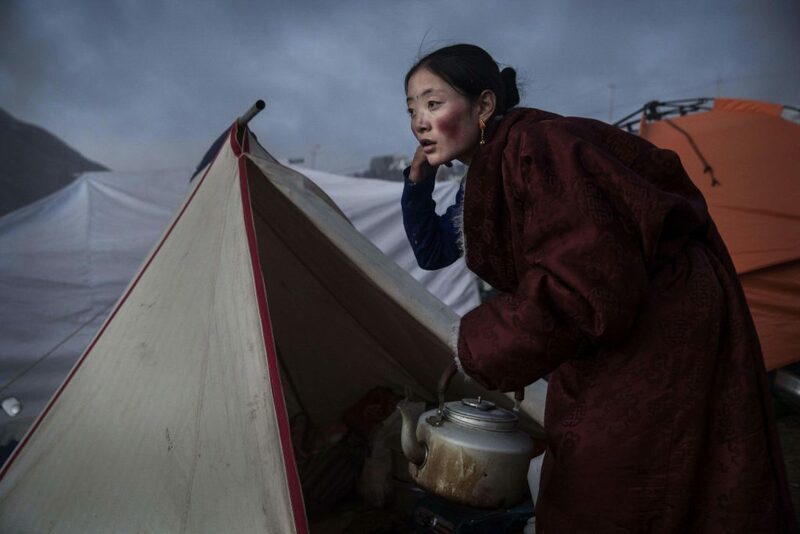 A Tibetan Buddhist nomad woman prepares tea at dusk following a chanting session. Photo Kevin Frayer. There’s a terrible trend on the planet now that our government here is mostly amending by the partnering with dictatorships, and this is an unfortunate thing. Therefore the Chinese and their Communist Imperium might be interested – because of the resources in Chinese culture – about what a responsible emperor is. They were buddhists for 1,000 of years, Confucius made a very honorable thing about being emperor. Things will turn around, and even here in the US. It’s important that people are aware of it, and familiar with it, because a human rights revolution is different than a communist revolution or any violent revolution – it’s a revolution that speaks against oppression. It’s very important that Tibet’s claims will succeed, as it will provide an example for many other minority issues; that violence is not the solution, but that actual dialogue and mutual support is the way forward. 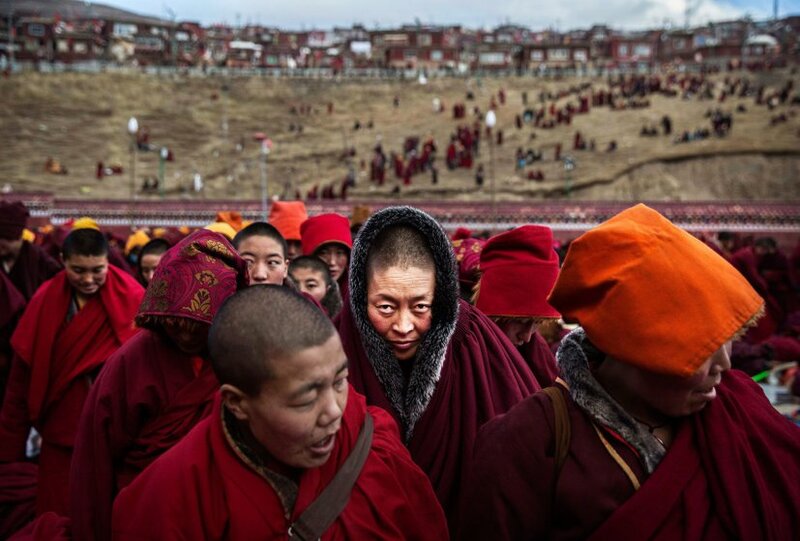 Tibetan Buddhist nuns. Photo Kevin Frayer. There’s so much going on in the world of today. Are people less interested in Tibet? No, Tibet is going way back to Shangri-La, Wakanda, the magical roots of the world, Alexandre Davide Neil; the great French explorer in the 20th century. It goes way back. That’s why the Chinese are trying to keep the Dalai Lama from going anywhere because he is so photogenic; people like him so much. He fills stadiums even if he’s not trying to turn anyone into a buddhist, He just wants people to have a better life. He specifically does not want them to shift away from their religion. In polls, his popularity is right up there with Pope Francis. It’s died down a little in terms of activism, but it’s still very strong. What has Tibet given you in your life? I love Tibet, it’s my intellectual home. The home of the scientific mind and psychology. I’d been looking to Freud, Wittgenstein and through that the original Indian enlightenment book about the Buddha. I was not a very religious, and I’m still not. The allure was more of a scientific and cultural side. You really find many things that are very deep in the Indian philosophy and science, especially in mental science, how you change the mindset, and how you deal with it. 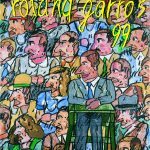 That’s what I found there, after Harvard : Great psychology and modules about the rules of relativity, biology with a soul and a mind instead of this ridiculous idea that everything is just atoms and molecules; where we’re trapped in the West at the moment. 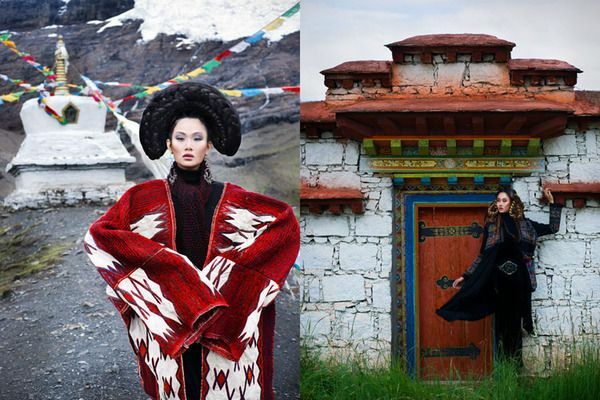 So, I have a gratitude to Tibet’s cultural and scientific gifts to me. The Dalai Lama was my friend since early sixties, the pre-hippie days. I worked to let people know about it. It was a cultural level for me, not so much a religious or a political level, so I’m very happy for that. I feel Tibetans are incredibly endurable and very strong. They resisted for over sixty years – reforms, class struggle and a kind of brainwashing they did really intensely. When there was a brief window in 1983-87, when China was trying to show nicer things, they started to rebuild their temples and their technical skills were amazing despite the fact that they’d been criminalizing this for thirty years. They just want to be Tibetans and have their culture. Tibet will become the jewell of China when they start caring about the Tibetans. They made some stupid decisions when they moved Chinese people and factories there to develop the area. The Chinese took all the benefits and they wrecked the environment, they looted it. Destroyed the rivers and now they have a big water problem. You can’t bite of your nose – you only have one. They’ve realized this at the very top leadership level but the implementation is complex, they have to figure out how to do this in terms of logistics and the ministries that are involved. Photos Nicoline Patricia Malina for Harper’s Bazaar. But they will do it and then Tibet will be a jewell, like Switzerland, and they’ll make a lot of tourist money. In the eighties, they had quite a good tourist income there. Then they started their crushing business by the late eighties, and they lost the foreign tourists and got Chinese tourists. But that does not bring in money, it just circulates it. 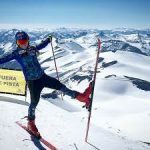 The point is; they’d make huge amounts in mountaineering, hiking, winter skiing, and the health industry – it could be a huge industry. The Chinese are not really communists. The politbureau is the imperial committee. And now their president has a lifelong period -the envy of Mr Trump. They will continue with socialism. Confucianism was also that, where everyone had their little land of 9 acres and paid one ninth of taxes to the state. 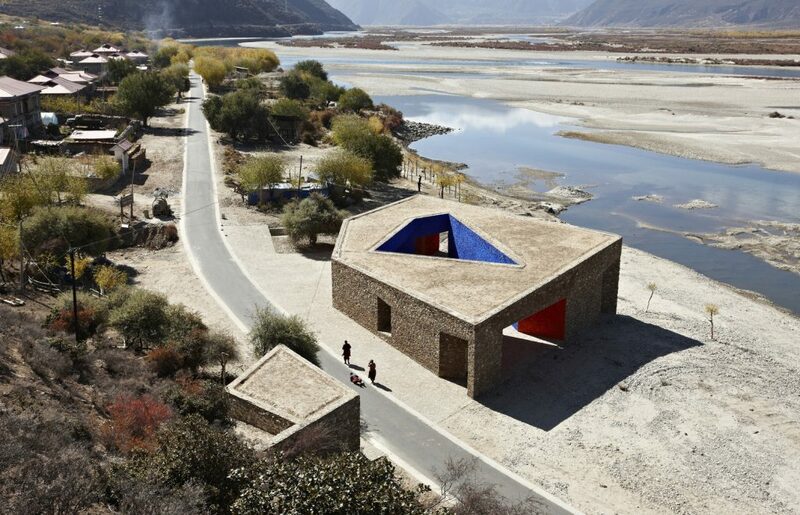 What are your thoughts on the Chinese architect, Zhang Ke who won a prize for his buildings by the Niyang river? He looks like a great guy. He did a great job, and as an artists I’m sure he appreciates Tibetan architecture and culture, and he made a modern version of that. A lot of Chinese love Tibet, actually, a lot of communist party members have the Dalai Lama in their little closet there, they do! And it’s just a matter of time before they kind of deal with it. Then they have to deal with the integration of the Chinese buddhism and Tibetan buddhism because they are different. The popularity of Tibets buddhism makes some of the Chinese teachers a little worried. There will be dialogue. It will all work out, I’m pretty sure.